The saying above means "the camel does not see its hump". It refers to someone who is always finding faults in other persons ,disqualifying them, puting them down and criticizing them perkly, even if he has the same defauts(bad qualities) himself and even more worse than the ones he find and defame in them. I’m looking for the equivalent of this saying in English. would you help please. Usually represented by this quote from the New Testament: And why beholdest thou the mote that is in thy brother's eye, but considerest not the beam that is in thine own eye? Other translations are available. Less is more (more or less). Everything looks yellow to a jaundiced eye. English has several similar sayings. "Why do you see the speck that is in your brother's eye, but do not notice the log that is in your own?" "You reveal your character by what you do with what you have." I don't think most people today would use a Biblical quotation, and "everything looks yellow to a jaundiced eye" means something a little different. The nearest I can think of is: 'People who live in glass houses shouldn't throw stones". People who are blind to their own faults shouldn't find fault with others. The other sayings are either more than 2000 years old or do not convey the same thing. Pata kattilaa soimaa - The pot calling the kettle black. "Th' kettle calling th' pot 'Sootybottom'." I know: That's the pot calling the kettle black. I have heard The pot calling the kettle black. In my language, we have a saying that a ladle with holes accuses a filter of containing so many holes. and so has this filter (used to clean grains, pulses). I would like to know what the native speakers call those things inserted by Stirr in his last post. 1st one: Ladle with hole? 2nd one: Sieve(I think) Correct? Here, we call it a "slotted spoon." Here, we call it a strainer. A slotted spoon is a spoon with slits/slots in. We, like JJ, call the other a sieve. Thanks for the words. I was not familiar with skimmer. In fact, for the other item, I was actually not trying to refer to sieve. It is more or less similar to a sieve, however both have different uses in the kitchen here. Do we have a different word for this in English? I sometimes feel that we as a second language learner, miss to learn the correct terms for common things. I personally do not use English of commonly used spices, grains etc. In the market or advertisements too, the local language is preferred even when describing everything else in English. You're right, srirr. There are lots of common words for common things, like kitchen utensils, you only learn if you need them. Was it Matthew or Luke who wrote this? "It is easier for a camel to go through the sieve, than for us to learn English." Yes. It is a funny holdover that people will use that saying now, even though a kettle has changed meaning, it is usually electric, and a pot is heated on a stove with nice clean-burning gas. Hardly a black pot or sooty-bottomed kettle in sight! dragon - I love that one by the way. Is it just me, or does he looked slightly shocked! 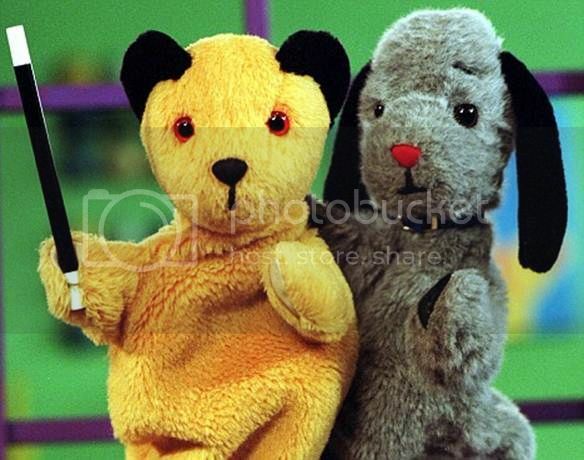 Ebenezer, in case you don't know, the puppets are called Sooty and Sweep. True - I occasionally see a black pot - but that's only when I forget that I put something on cooking. I think that what we used to call "town gas" - which was extracted from local coal - was a lot 'sootier' than the modern gas (though it has the same smell). 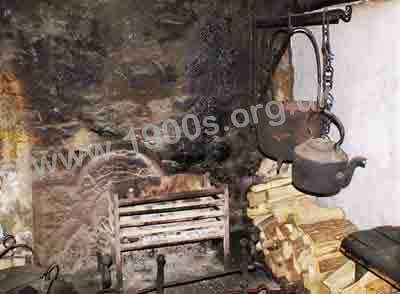 We did have a coal cooking suite in the fireplace, but never used it. A bit less 'fancy' than this one - only one oven. Thank you so very much everybody. [quote=thar]Yes. 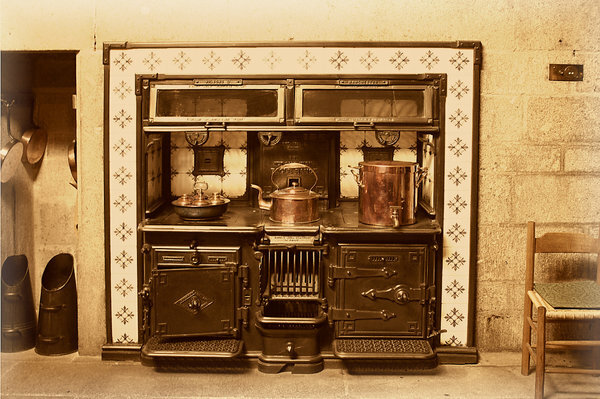 It is a funny holdover that people will use that saying now, even though a kettle has changed meaning, it is usually electric, and a pot is heated on a stove with nice clean-burning gas. Hardly a black pot or sooty-bottomed kettle in sight! Wow. This thread certainly got hijacked from the original question. It happens quite often in this forum, that after the original question is well solved and answered, the topic continues in its own serpentine paths. Usually in a lore expanding way, actually.